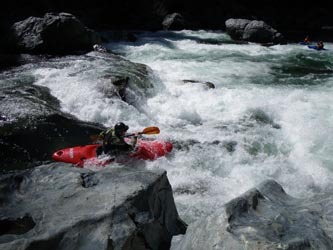 If you’re lacking the proper gear or the skills to maneuver class IV-V whitewater then a commercial rafting trip is for you. Typically an outfitter provides meals, shuttles, safety gear, camping, permits, and handles all the details. Most importantly, though, on a run as tough as the North Yuba, they provide knowledgeable, skilled guides who will lead you down the river. The Tahoe National Forest is located at 631 Coyote Street in Nevada City, off of Hwy 49. (530) 265-4531. Drop by the office to pick up permits, especially if you are hoping to have a campfire. Best to check in about this since fires are often banned in the summer months due to dry conditions. An overnight trip is recommended, but the North Fork Yuba River can also be run in a single day. For two-day trips there is easily accessible camping in many spots along the river. Camping is only allowed at Forest Service Campgrounds so look for the following campsites along the river: Union Flat (at put-in), Indian Valley at mile 17, and Fiddle Creek at the end of the run. Rafting or kayaking on the Yuba is typically a cold affair, so if you’re doing an overnight trip, bring extra layers and don’t forget matches and hot cocoa! 20 miles one-way will take about 30 minutes through windy roads. There are many access points along the river because it parallels Hwy 49. Put-in: Union Flat Campground is six miles east of Downieville on Hwy 49. To get to Goodyears Bar drive four miles west on Hwy 49 to the sideroad that crosses over the river to the left bank. Take-out: The best place to take out is the Hwy 49 Bridge, mile 19.